Prophet of Allah, Yunus was sent to the people of Nivenah near the land of Mosul in Iraq along the river Tigris. As all the Prophet of Allah, prophet yunus invited them to worship only Allah but they rejected him. When the situation continued for a long time, Prophet Yunus finally left them and told them that punishment will inflict upon them after three days! When prophet Yunus left them in anger, he went and boarded a ship. Howeer, after the ship has set sail, a big storm came upon them. The waves were huge and ship was in the verge of sinking! Conditions were becoming critical. Decisions were made after that, that it is necessary to cast a vote to pick someone to be thrown out of the boat to lighten the load. When they drew the lots, the name of Yunus alaihisalam came out. But the people knew him and did not want to throw him overboard. They repeated casting a vote and again the name of Prophet yunus came out again. They repeated the casting for the third time and again his name came up. When settled down, in the belly of the whale, Yunus alaihisalam thought that he was dead. He tried to move his limbs and they moved and thus he knew he was alive. When Allah made that whale go round and round in the depth of the sea, Prophet Yunus heard the glorification of All merciful by the whale. He even heard the pebbles glorifying Allah. Everything in this world Glorifies allah. Remember this lesson. At that, prophet Yunus started glorifying Allah himself. 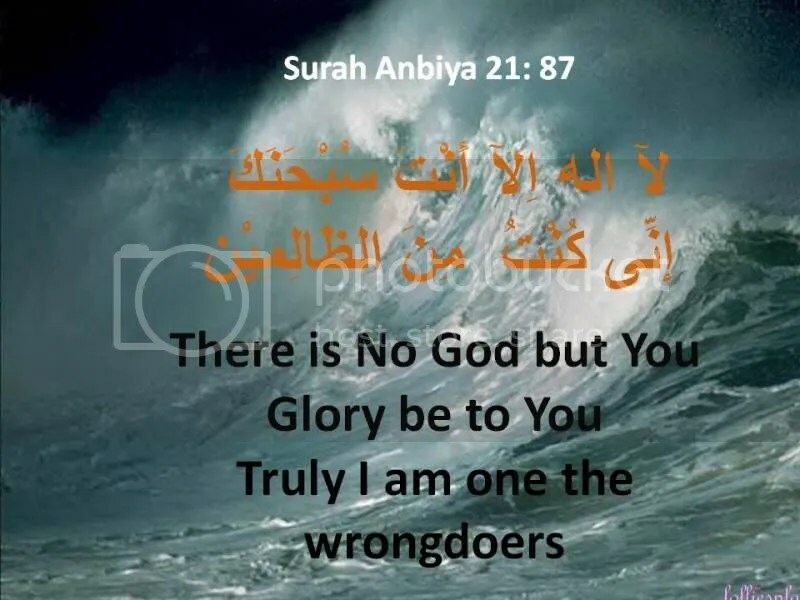 It is said that it means had he not glorified Allah therein, and said what he said, and confessed his sins accompanied with repentance, hewould have remained therein till the Day of Resurrection and been resurrected from the belly of the whale. It may also mean that because he is among those who is always glorifying Allah, who remembered Him and offered prayers frequently. O young boy, I will teach you some words. guard the duties of Allah and Allah will guard you. Also guard the duties of Allah and you will find Him beside you. When you remember Allah in good times, He will remember you when you are in hardship. So my children, the very same nasihah I will give to you. remember Allah all the time in your time of ease. fear Him. Insya Allah, Allah will support you at your time of difficulties. So Allah cast him on the bare shore where the beach has no trees or plants. Prophet Yunus was also in the state of sickness and was very weak. And Allah caused a marrow plant to grow over him. Then prophet Yunus went back to his people. But before that, when Prophet Yunus left his people, he also said to them that the punishmnet will inflict them after three days. Ibn Mas’ood,Mujahid, Qatadah and many others said that when he left them and his people became sure of the punishment befalling them. Then Allah guided them on repentance of their sins. they regretted the way they dealt with their prophet. Then they started imploring Allah for His Mercy while lowering themselves. Allah with His mercy and kindness removed them from their punishment, which was going to befall on them. Today we want to approach one of the dzikir that is beloved to Allah. remember when we learned about Al Quddus? Perhaps human and jinn are among Allah’s creation that do not Glorify Allah alot. So today we will see related narration on glorifying Allah to encourage us further and to increase our eeman. Subhanallah means Glorify to Allah. Which means you are glorifying your Creator. To say He has no flaw in His Perfection, that He is Far above any imperfection. He is far above and beyond any similarity to His Creation. So when you say Subhanallah, think of this that Allah is Mos Perfect. he has no flaw. And He has no similarity with anything. You say Subhanallah when you are at awe with something. For example, seeing a beautiful scenery. Try it. Is it easy for you? Abu Dharr reported, “the Prophet, peace be upon him, said, ‘Shall I tell you the words that Allah loves the most?’ I said, ‘Yes, tell me, O Messenger of Allah.’ He said, ‘The words most dear to Allah are subhan-Allah wa bihamdihi (Glorified is Allah with all praise due to Him)’.” This is narrated by Muslim and Tirmidhi. Abu Sa’id reported that the Prophet, peace be upon him, said, “Perform the enduring goods deeds more frequently.” The asked, “What are these enduring deeds?” The Prophet, peace be upon him, replied, At-Takbir, (Saying Allahu akbar i.e., Allah is the greatest) At-Tahlil, (Saying la ilaha ill-Allah, i.e., there is no god but Allah) At-Tasbih, (Saying subhan-Allah meaning, Exalted and far removed is Allah from any weakness) al-hamdu 1i-Allah, (This means: All praise belongs to Allah alone) and la hawla wala quwwata illa billah. (There is no power nor any authority except with the permission of Allah) This is reported by An-Nasa’i and Al-Hakim, who consider its chain of authorities sound. SubhanAllahi wa biHamdihi (Glory be to Allah and Praise Him). Abu Hurairah reported that the Prophet, peace be upon him, said, “Whoever says, ‘La llaha illa-Allahu wahdahu la sharika lahu, lahul-mulku wa lahul-hamd wa huwa ‘ala kulli shai’in qadir’ a hundred times during a day will have a reward equivalent to the reward for freeing ten slaves. Besides, a hundred good deeds will be recorded for him and a hundred bad deeds of his will be wiped off, and it will be a safeguard for him from Satan that day until evening, and no one will be better in deeds than such a person except he who does more than that.” (Bukhari, Muslim, Tirmidhi, Nasa’i, and Ibn Majah) In the version of Muslim, Tirmidhi, and Nasa’i, we find this addition: “And whoever says subhan Allah wa bi-hamdihi a hundred times during a day, will have all his sins wiped off even if they were as numerous as the foam on the surface of the sea.”…. SubhanAllah !